Author: Marcello Lamberti, Roberto Sottile. Series edited by: Marcello Lamberti. Wolaytta is one of the major Ethiopian languages boasting around one milion native speakers. It is spoken in the south Ethiopian Provinces of Gamu Gofa and Sidamo along the banks of the river Ometo. Genetically Wolaytta belongs to the Ometo sub-branch of Omotic (West Cushitic). 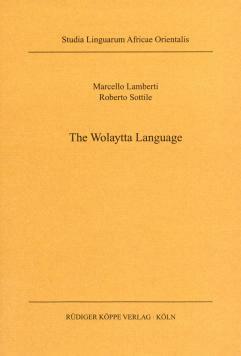 The present volume consists beside of a short introduction containing some historical, anthropological and cultural notes on the Wolaytta people, of a detailed synchronic description of the language, a list of more than 1,200 lexemes alphabetically ordered and integrated by several probable cognates attested in other Cushitic languages, a corpus of more than 1,100 selected Wolaytta sentences and finally a lexical index. The synchronic part of the work can be subdivided in three main parts: a phonological one devoted to the phonemic system of Wolaytta, a morphological one illustrating all the morphemes ascertained in the language and finally a syntactical part where the authors deal with the structure of the single clauses with their noun and verb phrases as well as several periphrastic constructions. Den umfangreichsten Teil (d.s. 2/3) des vorliegenden Werkes macht das Lexikon aus, das Elemente des Wolaitta-Wortschatzes in den anderen westkuschitischen (= omotischen) Sprachen und im Gesamtkuschitischen nachweist. Damit liegt das bislang umfangreichste vergleichende kuschitische Wörterbuch vor. [...] Eine Liste der Verwandtschaftsbezeichnungen, eine Sammlung von über tausend Sätzen mit Interlinearübersetzung und ein nützliches Englisch-Wolaitta-Glossar [...] runden diese wichtige kuschitistische Neuerscheinung ab.